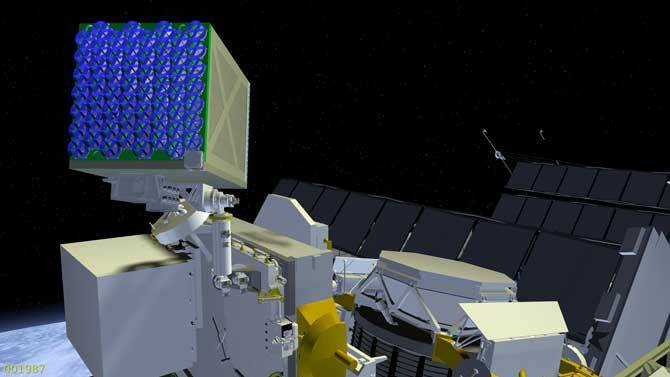 Rendition of the 56 X-ray telescope array that comprises SEXTANT, mounted on ISS (Credits: NASA). A sextant is an old-fashioned tool used for measuring angles between celestial objects. Sextants were used for navigation onboard ships to measure the angle of elevation from the horizon to reference stars, and other variants developed for astronomers to ascertain the positions of stars and planets. Now a team at NASA’s Goddard Spaceflight Center is proposing a new type of sextant: the Station Explorer for X-ray Timing and Navigation Technology. This cluster of 56 X-ray telescopes will be mounted on the International Space Station in 2017 to examine the interior of neutron stars. As a by-product, it will also test the viability of using neutron stars for navigational guidance on interplanetary missions, since their highly regular pulsations can be used somewhat like an atomic clock. Having such a method available frees spacecraft to travel autonomously, without reliance on the Earth-bound Deep Space Network of telescopes.